If you want to alter your life, building an altar is an excellent way to begin. An altar is a physical place or object used as a point of focus where one can raise or alter their state of consciousness, thereby gaining higher ground within the self. 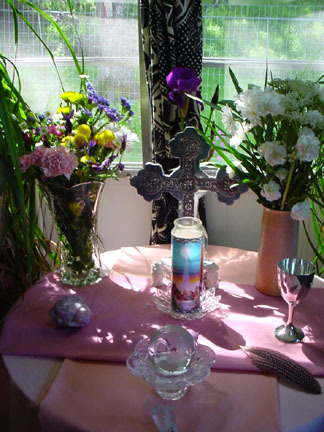 Altars and altar building can greatly benefit today's spiritual aspirant or disciple by grounding physically their dedication to spiritual ideals and the spiritual path. Constructing an altar today for your spiritual purposes is a process that draws largely from the wellspring of your own intuition ~ you don't have to concern yourself with the different altar forms as did the Greeks and Romans. 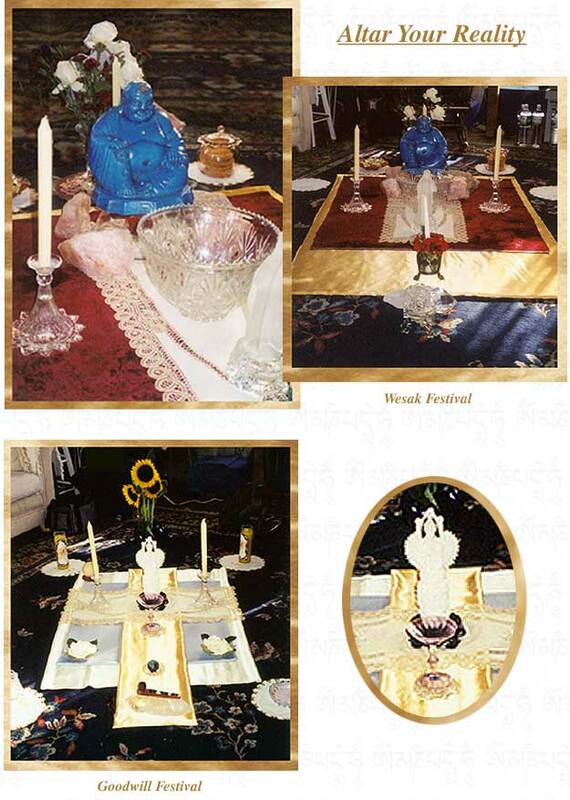 Nor do you have to limit yourself only to certain types of offerings on the altar, like the Hebrews. Your altar is your own high place, and you are its creator! The most needed forces in creating an altar are a calm, centered, grounded self, an open intuitive mind, and a reverence of spirit and your higher self. Simple or elaborate, consistent or changing, your altar is your personal statement to spirit and should reflect your own spiritual vision. 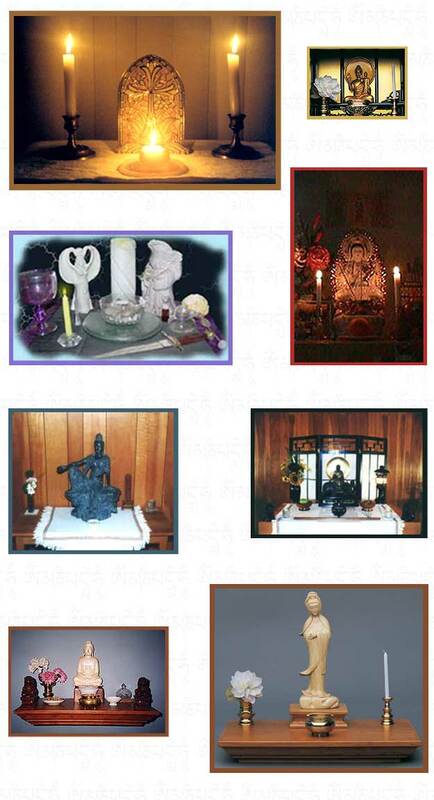 Altars are best placed in the east, or the power spot in your home where you feel comfortable and have affinity. For altars, a raised structure is recommended because elevation symbolizes the raising of consciousness up to the sacred. If you put your altar in a garden, a mound of earth or a large, unhewn stone works well. Indoors, a raised platform, a shelf, a mantelpiece, box, or small circular table will do. The structure should be a comfortable height to gaze upon, and should reflect your concept of the One. Can be viewed as an infinite space upon which Spirit creates its manifestations. The altar cloth represents infinity and emergence from the void. Choose colors your spirit is most drawn to for its present time needs. As sun and moon cycles change and as your energies shift and transform, you may feel guided to choose a new color altar cloth that reflects this change in vibration. Represents the essence or being of your altar, and is the point which contains the All, the One, and the point from which all the other objects radiate from. A candle is often the center, symbolizing the One Light, or it may be a statue whose essence you feel compelled to honor. If a statue is your center, then put the candle or candles near the center. Statues are a personal statement of energies you would like to be present in your life. Include as many or as few of the deities as you like. Symbols on altars are those objects that are magical to you. They can be beautiful (a flower or pretty stone), whimsical (a dragon or elf), earthly (a fetish), and so on. Can signify what you are sacrificing or giving up to be transformed. These can include your business card, photo of yourself or a friend, and the like. Offerings can also be gifts to the gods ~ flowers, small plants, fruit, grain, and even candy. After you have constructed your altar, you are ready for the final step ~ Blessing it. Historically, altars were blessed by sprinkling them with salt, which was a universally held substitute for the blood of animals. You may find altars are best blessed through the use of the mind. From a quiet, grounded space, gaze at each element on you altar, invoking its presence and blessing in you life. Look at your altar, and feel your consciousness rise to the level of the sacred.